I recently attempted to make Butternut Squash Soup, and the reason I didn't post the recipe was that it was too thin...and that I didn't have an immersion blender, so I mashed the squash and sweet potatoes in it with a potato masher. I called my dad, who is a chef, to ask him to send me his butternut squash soup recipe, and after hearing about my substandard potato mashing plight, he immediately went out and bought me an immersion blender (thanks Dad!). 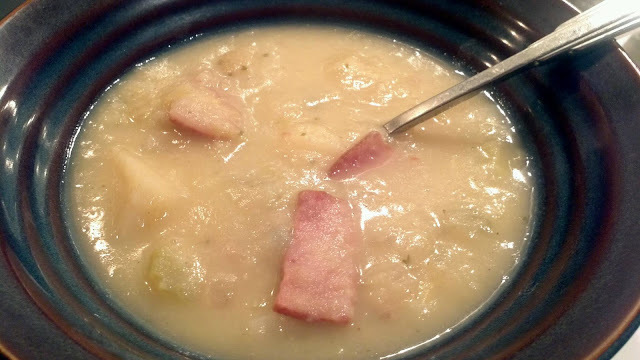 I haven't yet attempted his recipe, but I did use the blender for the first time today to make Slow Cooker Leek, Potato & Turkey Bacon Soup. This was also my first time working with leeks, and I have to say, they are pretty time consuming to wash and chop, so give yourself a few extra minutes to prepare this recipe. I sliced off the stems and the dark green section, soaked them in a large mixing bowl to rinse them and then sliced them. I used PC Blue Menu Turkey Bacon strips for this recipe, but you could also swap it for regular bacon or diced ham, if you prefer. Slice turkey bacon into small pieces and pan fry for 5 minutes on medium heat. Set aside. Layer potatoes in bottom of slow cooker pot. Season potatoes with paprika, cayenne, parsley, salt and pepper. Add fried turkey bacon pieces on top of potatoes. Add celery, onions, garlic and leeks. Pour chicken broth on top and add bay leaf. Cover and cook on high for 4 hours. When there is 15 minutes remaining on the cooking time, remove bay leaf, and add milk and butter and stir. Replace lid and cook for remaining time. When cook time is complete, unplug slow cooker and remove lid. Using a ladle, scoop out half the chunks and pour into a large bowl. Using an immersion blender, puree the soup remaining in the slow cooker pot. Pour the contents of the mixing bowl back into the slow cooker pot and serve.